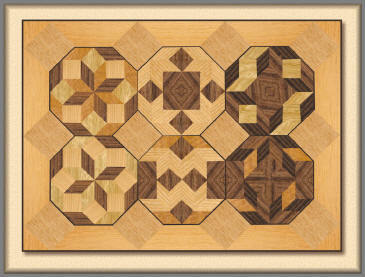 As an introduction to working with decorative veneers, parquetry has everything to recommend it. You may not be inclined towards pictorial marquetry, but with some veneers - like the ones we show here - plus a ruler, and a sharp knife you can create myriad's of patterns for large furniture or (just for a start) table mats. Parquetry is the art of designing and constructing geometric patterns in wood veneer, using the same tools and materials as marquetry, but making different demands on skills, especially in the cutting. 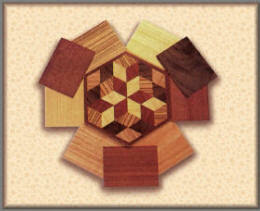 Marquetry calls for a well developed artistic sense to produce top quality original work. It involves freehand cutting, and beginners usually start with kits to develop knowledge of veneers and technical skills before moving on to their own designs. 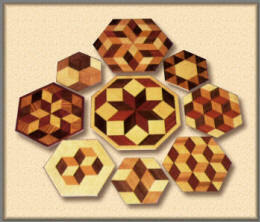 Parquetry, on the other hand, will appeal to everyone who enjoys veneers, particularly if you also enjoy maths! You will he designing your own patterns almost from the beginning; there are no kits or recommended designs to work through. Accuracy is achieved with rulers and jigs, using measuring and straight-line cutting techniques familiar to all woodworkers. You'll find here a series of logical exercises showing how to produce the basic patterns. Using a little imagination, you can then develop your own designs and assemblies, playing mathematical games. Learning is by doing - and enjoying the process. As you experiment, you'll find yourself wondering how to produce specific effects you want. You might start looking into the elements of mathematics which are the essential background to the craft, but many people prefer to work out practical solutions of their own. Since the shapes to be cut - straight lines or regular curves - are straightforward, use a more robust style of knife than you would for marquetry, like a Swann-Morton craft knife with nos. 1 & 2 blades (or other makers' equivalents). Use an engineer's rule for cutting accurate straight lines. It is graduated and has two good straight edges, parallel to each other, which are essential. You won't normally require a specific size. When you do need a specific width, as in tile assembly (often referred to as "stick as you go" by older members of the Marquetry Society), you may have to make a metal parallel cutting guide using a guillotine, or one in 6mm ply using a panel or circular saw for accuracy. Finish the plywood edge by hand, using file and sandpaper. For measuring and setting the angles required, use clear plastic 90/45° and 60/30° set squares, large ones for accuracy. Use clear sticky tape for holding veneer pieces in position and/or joining strips together, but choose a cheap tape with limited stick, generally found on market stalls. You can use any wood glue for final assembly, although PVA is often the preferred glue these days, and of course it is suitable when you're sticking piece by piece direct to the baseboard using the 'tile' or 'stick as you go' method. For generally sticking taped assemblies use Cascamite, Contact glue, Glufilm or even balsa cement if PVA is not available. 1/. 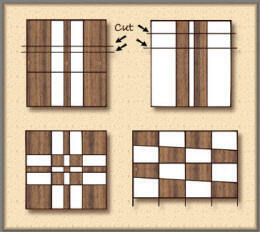 Strip method: all cutting and assembly is done using strips of veneer. This method is relatively easy, calls only for the accurate cutting of parallel strips of veneer, and avoids any build-up of cumulative errors. 2/. 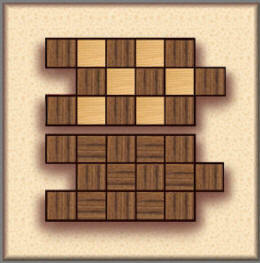 Tile assembly method: shapes are cut either in strips or individually, but assembled piece by piece. This requires greater accuracy since only small individual mistakes in cutting will accumulate to produce significant errors. In each case you need to make simple jigs for repetitive cutting of parallel strips to a specific size and with accurate angles. Make a simple jig for strip cutting from a plywood or chipboard base (6-12mm thick) with a metal or ply guide strip about 1 in wide. Cut the ply strip with a panel or crosscut saw to produce a straight edge, and then true it with sandpaper and a file, before pinning and gluing it to one edge of the hoard as a stop. 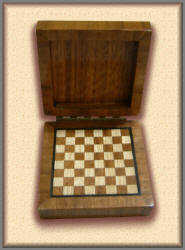 You'll understand how the jig is used if you follow the stages in making the chessboard pattern (fig. 1). Place a piece of veneer on the board against the guide stop, with the grain at 90° to the edge. Place your ruler on top of the veneer, tight up to the guide and cut a strip across the grain the width of the ruler. This first strip is waste unless the original edge was straight and true. Now repeat the procedure, cutting a number of parallel strips of the first veneer. Then you can cut strips of a contrasting veneer. As you cut the edges take care the veneer doesn't break out; ease the pressure on the knife or use a number of gentle cuts. Try sticking small pieces of tape on the veneer surface as reinforcement. For the second stage, tape strips of the two veneers in an alternating pattern, with sticky or veneer tape along the joins on the face side. Feed this composite veneer into the jig up to the guide stop, using a set-square to check that the strips are exactly at right angles to the guide. Using the ruler as before, cut a series of strips parallel to the guide edge, rejecting the first one as waste. The strips of squares can now be taped together, displacing them alternatively to the left and right for the pattern you want (fig. 1). This is the basic strip method technique. By varying the angle of the second cut (60° and 45° on set squares) and other modifications, we will show you some examples of this later on in this series. c/ the width of strip used. 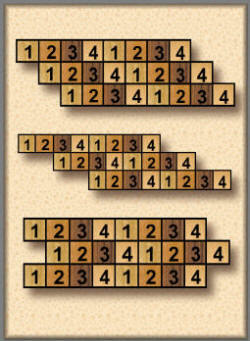 By shuffling the combinations you'll get a vast range of different effects. Once you've practised this method and recognise its potential you might want to construct patterns which can't be built up from simple strips. You can actually cut some patterns (fig. 7) by the strip method, but others (figs 8, 9) involve geometric shapes which must be cut individually. Since both groups are individually assembled you have to cut really accurately. The width of squares and diamonds and hence the length of the sides must be precise and, where angles join at a point, they must add up to exactly 360°. To improve the accuracy of angle cutting, I add a second guide to the strip-cutting jig. It is pinned and glued at the required angle to the first guide (generally 90°, 60°, or 45°) depending on the shape you want. Get the angle absolutely accurate with a large plastic set square, and allow a gap between the ends of the guides to suit the width of your ruler. This second guide enables you to make sure the angle of the second-stage cut is right every time, because you check the fit against both guide edges before cutting each parallel strip. If you mount guides at different angles on each side of a baseboard, each base can provide two different jigs. I keep them in strip form on the sticky tape for ease of handling and protection, peeling off individual shapes when I need them. You can see various combinations made with 60° diamonds in fig. 7. I suggest you make up the single-colour hexagons from three diamonds of the same veneer, contrasting the grain directions. When you assemble them, use small pieces of sticky tape on the face side to hold the individual pieces together, lining up edges and corners to get a perfectly true final shape. I often assemble freehand, experimenting with the individual shapes until I get the effect I want. Then I draw the pattern on a sheet of paper and reassemble over this plan to get it right. Another assembly technique, useful when patterns become more complex, is to cover the design with clear sticky-back plastic, sticky side up, held in place with a few pieces of tape. It's easier to experiment with and rearrange shapes on this material than use sticky tape on single pieces or combinations. 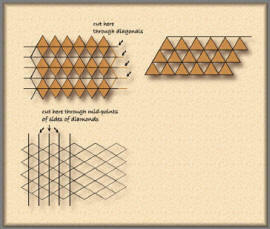 Now look at the patterns using 45° diamonds mixed with squares (fig. 8), and you'll notice a new problem. In previous designs, once you'd chosen the width of ruler the resulting shapes all had a common edge length. When you start mixing diamonds and squares, this no longer holds true. A practical solution to this problem is to draw the pattern out on a sheet of paper, using the actual diamonds as a guide to size. Draw the best square through the tips of the diamonds; small differences in the cutting and assembly of the diamonds will lead to a degree of 'averaging' here. Now you can cut the squares individually and hand fit them to the pattern; that's how I did these examples. This is accurate enough to construct quite complicated assemblies (fig. 9) but it does take time. There is an alternative mathematical method; make a parallel cutting guide 1.414 times the width of the ruler used to cut the diamonds. Thus if the ruler were ¾ in wide, you'd need a cutting guide ¾ x 1.414=1.061in. Cut a 6mm ply strip to size and trim it care­fully, using a vernier gauge to check the width. Normally you should assemble the whole veneer surface complete with surrounds and borders as a veneer lay-on, held together with tape ready for gluing down in a single operation. This is straightforward with contact glue, and no clamping is required. Water-based contact glues tend to curl the veneer and cause some laying problems, so take care if you're using these. You can also use water-based glues such as Cascamite and PVA, but the veneer will naturally curl when it absorbs water from the glue. So it must be held flat and in contact with the base surface with good cramping while the glue dries. For large surfaces you'll have to use a press or temporary cramping arrangement with boards and G-cramps, since the forces involved are quire large. With areas up to about one square foot, you can get enough pressure with weights or even by standing on the board. I often lay marquetry pictures of this size by inverting the glued assembly face-down on to a flat surface and standing on it for 15-20 minutes! Check the work after 20-30 minutes of clamping and if there are any bubbles, blisters or wrinkles in the veneer surface, cover it with brown paper (not newspaper!) for protection and iron over the surface lightly to press out air, flatten the veneer and speed the setting of the glue. Fig 7: Work on these 60° variations, or make your own. The reason you shouldn't use newspaper is that the print, or ink, from the paper, even though it dry to the touch, can easily transfer itself from the paper to your work while being clamped. On medium heat, iron it from the centre outwards, taking care not to overheat the veneer, or it'll shrink and crack. After ironing, press for at least another 10-15 minutes. When the glue has dried, sand the surface: obviously you can't sand wholly with the grain, but this is no problem if you finish progressively, ending with a 320-grit paper. You can use any normal clear wood­working polishes, from matt to gloss, but many people prefer a satin finish to highlight the beauty of the contrasting grains, which catch the light at different angles. 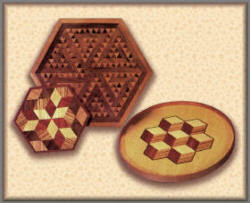 Traditionally, parquetry and marquetry were used to decorate items from long-case clocks and bureaux down to boxes, table mats, trays and coasters. On some items - even long-case clocks - parquetry was used to cover the whole surface, while elsewhere it was used as a decorative feature to relieve an otherwise plain veneer face. Compare the examples shown here, from the face of the box covered in parquetry to the circular tray where it's used as a central decorative feature. You might consider using parquetry as a decorative feature for other applications, including kitchen units, internal doors, bedroom furniture, coffee tables, desk-top accessories, boxes and even personal jewellery. Although normally laid as an integral part of the surface, small tasteful decorative features can be used as overlays on an already existing surface. get you to this patience-testing conglomerate!